All eight Mega Man X games are coming to current-gen platforms, Capcom said today on a stream celebrating the 30th anniversary of Mega Man. The publisher later added that all of the games will be coming to Switch, PS4, Xbox One, and PC in the summer of 2018. Mega Man X, which started on the Super Nintendo as a sort of soft-reboot for the classic 2D platforming series, has long been one of the most beloved entries in the franchise. Adding a new protagonist, Zero, and a new villain, Sigma, the Mega Man X series spanned across the SNES, PlayStation, and PlayStation 2 before finally ending with Mega Man X8 in 2004. This news came in conjunction with word that Mega Man Legacy Collections 1 and 2, which together include Mega Man 1 through 10, will come to Switch in 2018. During the stream, Capcom also announced Mega Man 11 for current-gen platforms. 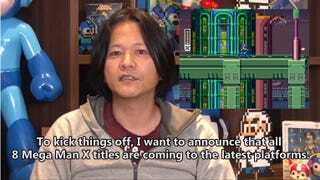 Note: An earlier version of this article said that the release would be a Mega Man X collection, but a more careful look at Capcom’s language suggests that the games may be released separately. We’ve reached out to the company for more details.